I think the best resort in the Metro Cebu area is the Shangri-la Mactan Island Resort (even though I haven’t been to Cebu). But that’s just my impression. However, there’s no question that the best resort in the Davao City area is the Barcelo Pearl Farm Beach Resort. This beach resort is tucked away on the western shore of the Island Garden City of Samal, Davao del Norte and is reached by a 45-minute boat ride from downtown Davao City. And because it’s on the western side of the island, you have spectacular views of the setting sun. Pearl Farm was so named because since 1958 it was once a cultivation spot for pearls. Thousands of oysters were brought in from Sulu Sea and grown here producing pink, white and gold pearls. The pearl farm is no more and in its place is a world-class triple-A resort. 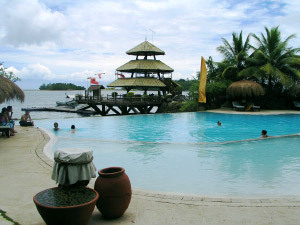 It’s also the #1 rated resort/hotel in the Davao area according to Yahoo! Travel. Arguably the most well-known symbol of the resort is the Parola Wharf, pictured above in front of the two-level infinity pool. In our article thumbnail at the top-left, the pool and the Wharf are the ones depicted. (I cleaned up the satellite image from Google Maps because the sunlight reflecting off the sea is too distracting.) But the beach resort is more than the Wharf and the pool. Spread out over 14 hectares, including Malipano Island half a kilometer to the west, Pearl Farm boasts of 73 units of accommodations, a three-hole golf course, tennis courts, and plenty of water to go kayaking, scuba diving, snorkeling, windsurfing, jet skiing, and water skiing. And just like Davao City, there’s free Wi-Fi right down to the beach! See more interesting photos of the resort from their official website, a visitor’s photo galery, and user submissions from Flickr. Beautiful, ain’t it? Pearl farm beach resort is amazing. luv it.